Later in the night, things quieted down over at the Boise Contemporary Theater where folk songstress and storyteller extraordinaire Laura Veirs charmed an at-capacity crowd. “I’ve never played with a string quartet before,” she said before the Boise Philharmonic four-piece, who had just performed a showcase of their own, joined her on stage for a few tunes. At that point, Veirs switched to the keyboard, an instrument she said she “didn’t know how to play” and thusly marked with color-coded tape. You’d never know she was a novice, though—the five musicians delivered a spotless and whimsical set. After the quartet’s exit, Veirs returned to solo acoustic at which time she played a few songs from 2013’s Warp and Weft, including “Sun Song.” “This song is about the sun,” she said. “I live in Portland, Oregon, so we don’t get much of that.” Perhaps not, but her sunny disposition was enough to easily win over audience members, many of whom sat cross-legged on the ground in front of her. The magic of Treefort and other festivals like it is that you can go from hearing quiet story-songs in a community theater one minute to ear-busting noise-rock in a dive bar the next. It’s a model that not only nurtures diverse music discovery among attendees but also caters to a breadth of artists. 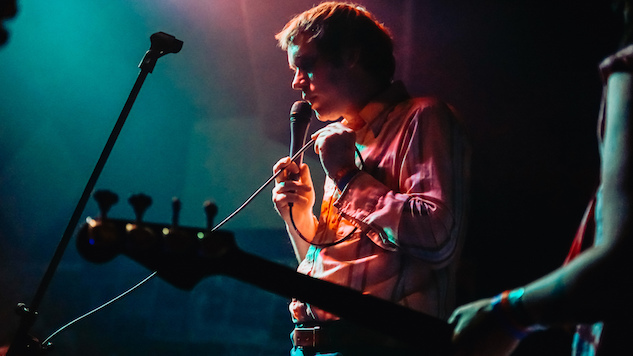 After Veirs’ set, I journeyed to local spot The Shredder to see Mike Krol, one of our can’t-miss acts of the whole festival. Fellow Merge Records signee Allison Crutchfield (of Swearin’) joined Krol’s band as bassist, and they put on the most raucous show I’ve seen this week. Playfully mirroring the album art for Krol’s latest release Power Chords, Crutchfield sported a painted-on bloody nose while Krol appeared in complete costume, black eye and all. Had I not brought ear plugs, my drums would have been just as pummeled. Earlier in the night, I caught up with Seattle-based Whitney Ballen, who played songs from her recent album You’re A Shooting Star, I’m A Sinking Ship to a calm crowd at local coffee shop The District. She has one of the most distinct new voices I’ve heard on the festival circuit these last few weeks, and she has a twisted, sly way of making topics like loneliness sound relatable and funny. Anemone, another group I was stoked to see in Boise, brought their playful groovy art-pop to the Neurolux for a late-night party. Frontwoman Chloé Soldevila didn’t sit still for a single moment during their time on the tiny stage. It was a tremendously fun performance that lived up to the hype they attracted last week at South By Southwest.